Mike has accumulated way more "projects" than he has time or money to complete in one lifetime! Here are a couple of big items currently available for sale. Antique tractors and parts will be coming soon. 1950 - Ford F-2 Pickup - FOR SALE! 1998 Harley Davidson Road King FLHPI Police Model - FOR SALE! Welcome to Dunton Family Farms' web site. Established in 1909, we have been online since 1996. Our mission is to hold on to what we can of our agrarian past while gently moving forward into the future. We believe that we are simply stewards of this land and therefore nurture it accordingly. It has reciprocated by sustaining five generations of our family - three of which are still actively working here. We have farmed using organic and sustainable practices since it was a still a grassroots movement in the 1980s. To keep with these roots, we chose to become Certified Naturally Grown in 2006 instead of pursuing certification under the USDA's National Organic Program. To learn more and our thoughts on this subject, please click here. Our farm is the home of the Victory Seed Company whose mission is to search out, document, preserve and make available to gardeners, rare garden seed varieties. 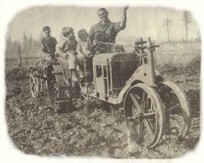 We offer our Victory Seeds® online at VictorySeeds.com and hope to open an on-farm retail center in the near future. Please be sure to explore the nooks and crannies of the site. The Dunton Family Farm is a participant in the Amazon Services LLC Associates Program, an affiliate advertising program designed to provide a means for sites to earn advertising fees by advertising and linking to amazon.com.